Sew Inspired: Sew and Tell--Finished 9-Patch Quilt! Here's my 9-patch quilt all finished! 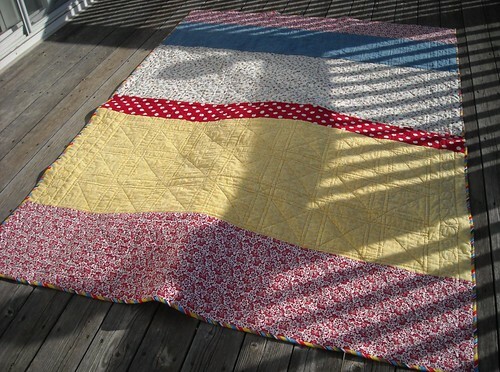 Measurements after washing/drying: 63" x 84"
Quiltalong info (how to make this quilt) from AmandaJean found here. I'm so happy this one's done! I'm linking up at Sew and Tell Fridays ... thanks again, Amy, for hosting! It looks awesome! I might sound dumb but does washing the quilt make a big difference? I always read about people saying how they washed the quilt and then it was "done". I am nervous about washing quilts. I just think that they will fall apart and all of my hard work will be lost! I guess that's silly though. Great finish! It turned out fantastic Vicki, love the back just as much as the front! I love it!!! Especially the circles quilted in the border squares. Wonderful job, as always, Vic! I made this one also. YOurs is beautiful! 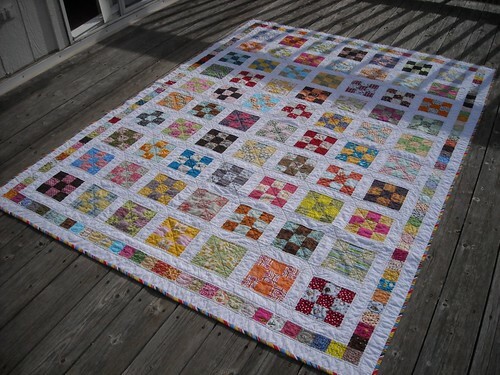 This is such a great quilt! It makes me want to start sewing RIGHT NOW! Gorgeous! Beautiful! 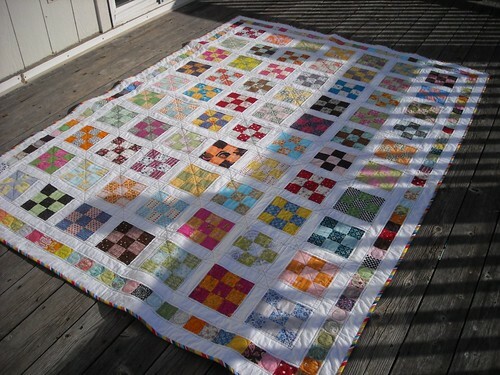 I love the colors, I would love to try quilting this one day, because yours looks awesome! What a beauty! Something to treasure for a very long time. When I saw 9-patch, I was not thrilled, but when I saw your quilt, I said WOW. I like it very much, back and front. Wow....so many bright colors working together so well...I'm impressed! I love this quilt. I love the simplicity of it, the scrappiness, and the border... truly a treasure. you really did such an amazing job...i love the quilting around the border and your backing is so fun. Super cute! Every time I see one of these, I want to make one...great finish!! I'm with Amy! i want to make one too! this is awesome! Lauren, washing and drying usually changes up the texture of the quilt and makes it kind of crinkly and softer somehow. Especially if the fabric wasn't prewashed. If you use good construction and quilting techniques, washing shouldn't cause any problems to your quilt! Your quilt is beautiful! Seriously, so lovely. What an inspiration. This is sure a beauty! I really love 9 patch quilts. Yours is great.